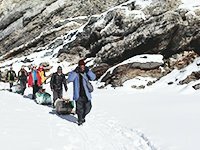 The CHADAR trek is well known as a very unique winter trek & expedition in Ladakh. It is called Khado sanglam in Zanskari language, the (Dakini Path) which people of Zanskar use as the last way to connect when there is no link with the out side world and hence it is left almost isolated from the rest of the world for a few months each year after the routes remain cut off due to heavy snow fall. Chadar means white sheet of crystal ice and it is a lifetime experience for the trekkers. 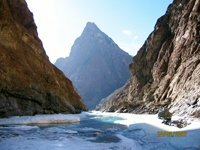 This trek is considered as one of the most exciting and unique treks – a very special and an extraordinary trek onshiny ice on the bank of Tsarap River. You will be dropped by a vehicle at Chilling Sumdo (crossed road) then yourtrek leads in a narrow valley filled with breath-taking views of ice-peaks and unexpected hanging icicles that will attract your gaze for some time. You will spend the night at cave camps with the help of a born fire that will keep you warm and relaxed. Mindruk trek & Meditation team is local and well equipped by the experience of this Adventurous ice expedition trek. Temperature: below –20 (min) to 30 (max). Note. You need to have warm sleeping bags, warm clothing, gloves, some pairs of socks and specially walking sticks.